Between Lady M’s current health, my own sideways brain, and some other things that have affected us on a personal level over the last month or so, we’ve needed something to cheer and distract us. 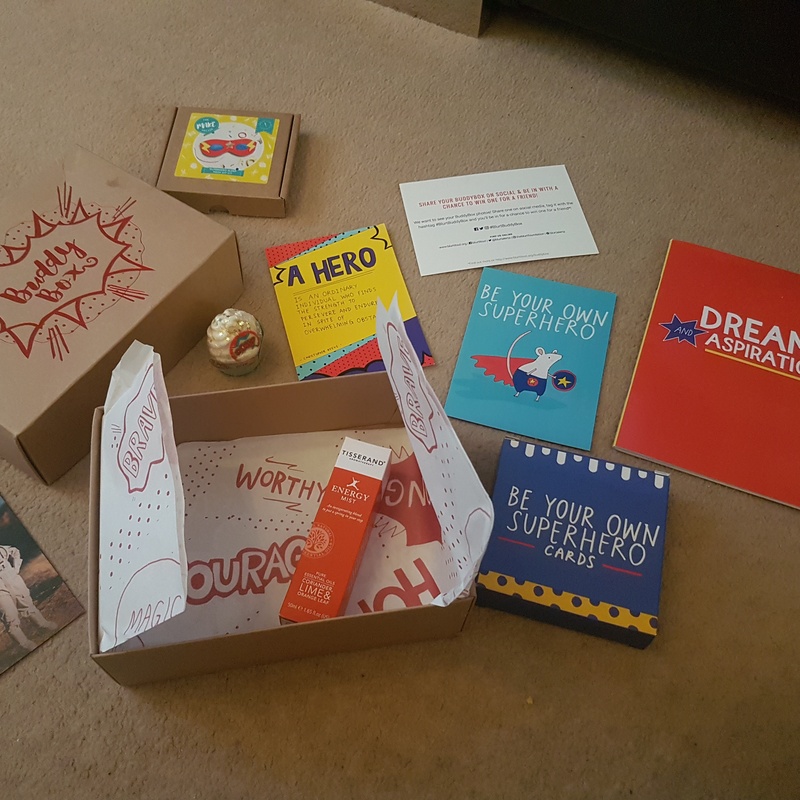 A sponsored post on my social media field caught my eye last week – so I invoked my personal mantra of “What’s the worst that could happen?” and ordered a Blurt Foundation Buddy Box. If you’ve not encountered the Blurt Foundation, they’ve been sending out monthly care packages for a while now. A British charity set up to support, help and inspire people affected by depression – whether as sufferers, or their supporters – they raise money by selling subscriptions for little care packages of… nice things to distract and inspire. They’re usually themed, and everything I’d seen suggested they were fun. I just didn’t necessarily fancy taking out a subscription. The advert I saw though offered the option of buying a standalone box as a one-off. This particular advert had the tagline of being your own superhero, and being the unashamed geeks that we are, I knew this would make us both smile. We weren’t disappointed in any way. It’s simple enough in some ways – printed cards, a bath bomb, a scented aromatherapy spray, a small booklet, and a sewing kit with instructions for making your own superhero (sleep)mask – but there’s some clever and positive use of language that has indeed put a grin on both our faces. And this is the great thing about this box. At no point in the process of ordering, receiving or opening it has the language and tone in any way felt condescending, or sickly, or anything other than a slice of positivity. It’s been nice just to sit down together and coo over the contents as we unboxed it and read bits to each other. And sometimes that’s all we need: a little distraction, a little levity, something to engage creativity and inspire. This entry was posted in family, Geekery, household, idle musings, mental health, relationships and tagged BlurtBuddyBox, family, geekery, household, idle musings, mental health, relationships. Bookmark the permalink.